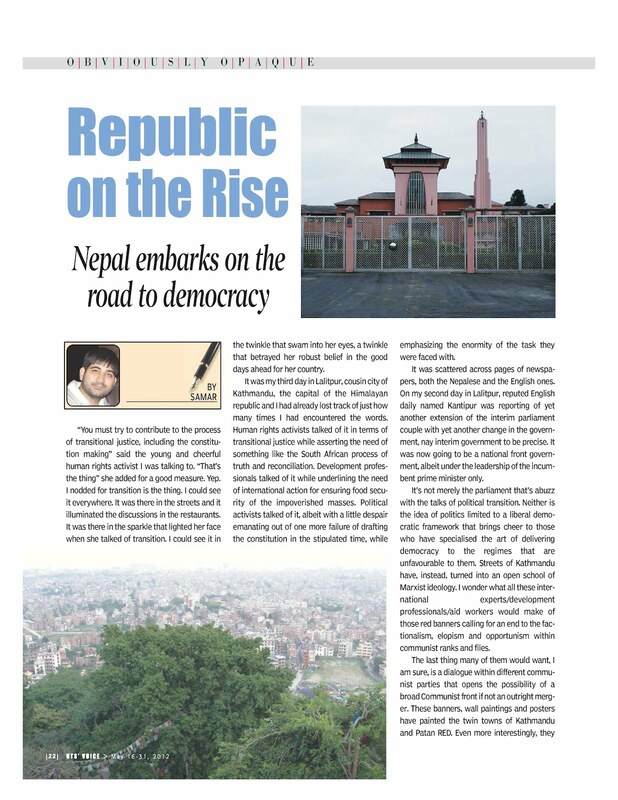 Republic on the Rise: Nepal embarks on the road to democracy. “You must try to contribute to the process of transitional justice, including the constitution making” said the young and cheerful human rights activist I was talking to. “That’s the thing” she added for a good measure. Yep. I nodded for transition is the thing. I could see it everywhere. It was there in the streets and it illuminated the discussions in the restaurants. It was there in the sparkle that lighted her face when she talked of transition. I could see it in the twinkle that swam into her eyes, a twinkle that betrayed her robust belief in the good days ahead for her country. It was my third day in Lalitpur, cousin city of Kathmandu, the capital of the Himalayan republic and I had already lost track of just how many times I had encountered the words. Human rights activists talked of it in terms of transitional justice while asserting the need of something like the South African process of truth and reconciliation. Development professionals talked of it while underlining the need of international action for ensuring food security of the impoverished masses. Political activists talked of it, albeit with a little despair emanating out of one more failure of drafting the constitution in the stipulated time, while emphasizing the enormity of the task they were faced with. 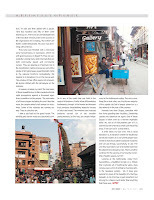 It was scattered across pages of newspapers, both the Nepalese and the English ones. 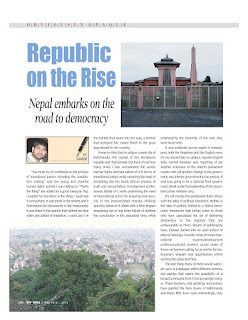 On my second day in Lalitpur, reputed English daily named Kantipur was reporting of yet another extension of the interim parliament couple with yet another change in the government, nay interim government to be precise. It was now going to be a national front government, albeit under the leadership of the incumbent prime minister only. It’s not merely the parliament that’s abuzz with the talks of political transition. Neither is the idea of politics limited to a liberal democratic framework that brings cheer to those who have specialised the art of delivering democracy to the regimes that are unfavourable to them. Streets of Kathmandu have, instead, turned into an open school of Marxist ideology. I wonder what all these international experts/development professionals/aid workers would make of those red banners calling for an end to the factionalism, elopism and opportunism within communist ranks and files. The last thing many of them would want, I am sure, is a dialogue within different communist parties that opens the possibility of a broad Communist front if not an outright merger. These banners, wall paintings and posters have painted the twin towns of Kathmandu and Patan RED. Even more interestingly, they have been put not merely by many communist parties that dominate the Nepali political scene as of now but also by trade unions like All Nepal trade Union of Restaurent workers (translation mine). A satisfying smile forces its way on my face. The process of trade unionisation is so complete in this country which was an absolute monarchy just a few years back! Not that the forces of positive, however divided, are the only forces trying to take Nepal their way. 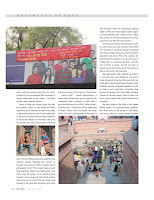 There were many a wall writings of a Hindu Party of Nepal as well, with Revolutionary added to its name in brackets for effects, calling for ensuring the safety, survival and dignity of Hindus of Nepal! Hinduism is the majority religion in Nepal is beside the point. Their safety, survival and dignity are not threatened by whosoever seems even more irrelevant to whatever political group this is. Interestingly the Nepali Congress (Koirala faction) is conspicuously absent from the streets despite its huge support that is second only to two of the biggest communist parties. “Ah, they are too elite and too assured of their support to engage in such menial labour” quips another Nepali activist friend of mine. Transition. The word defines the blossoming republic that was born out of mass protests called Janandolan that swept the monarchy away in its tide. Transition. The word guarantees that this time the republic has come there to stay unlike all those false starts that had come the nation’s way. Of course it would not be a smooth ride; it just cannot be for throwing off the yoke of that dreaded feudal monarchy is nothing less than a herculean task. Of course it would be fraught with dangers, both from within and without for the influence of the erstwhile monarchy still holds some, even if greatly diminished, ground. Losing respect and power, as it is, does not necessarily translate into the loss of conspiratorial prowess, does it? Couple this with the vested interests that have entrenched themselves deep into the power corridors and the recipe for an impending threat is complete. Their scheming designs have drawn blood in the past and they cannot be believed to sit idle this time. Not this time though. For the republic has drawn its first blood as well. The first thing it did was turning the then ‘Hindu Rashtra’ into a secular republic and thus correcting a historical wrong committed on Nepali people by the erstwhile monarchy that claimed to be of a divine origin. Unlike its western counterparts, this one was not to be content with a claim of being the ‘march of the God on the earth’ but wanted to be God itself, so it did precisely that. The kings claimed to be the incarnation of incarnation of Lord Vishnu, one of the Holy Trinity that sits at the apex of Hinduism. They claimed, for I am sure that even they themselves won’t be stupid enough to believe that ridiculous assertion of their own. The republic has cut them, and all their claims, to size. There are no more Gods roaming through the streets of Kathmandu or Lalitpur. People have snatched all their streets, all their roads back. They have taken all those Darbars, or the squares surrounding the palaces, back too. 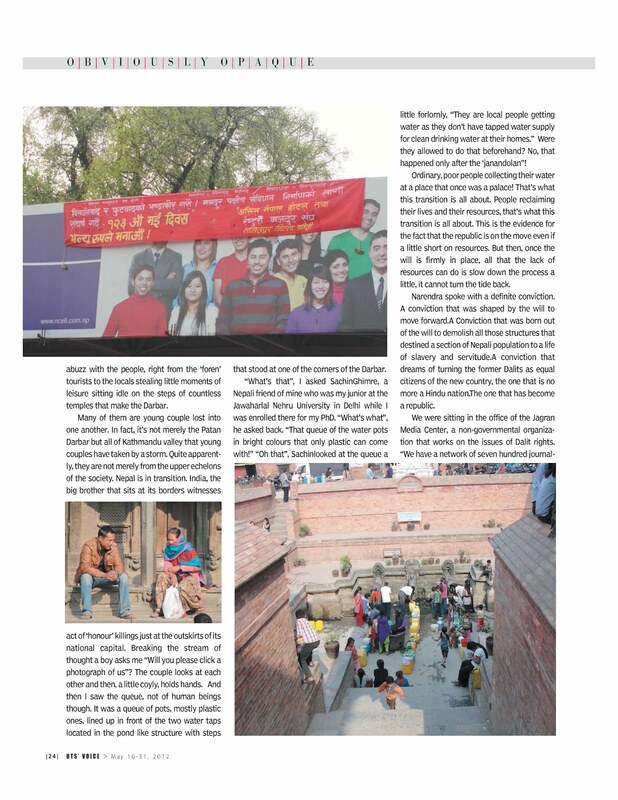 In fact, it was at the Patan darbar where I witnesses one of the most fascinating glimpse of the transition that is seeping into the ordinary lives of these ordinary people. Darbar, at the center of Lalitpur, was abuzz with the people, right from the ‘foren’ tourists to the locals stealing little moments of leisure sitting idle on the steps of countless temples that make the Darbar. Many of them are young couples lost into one another. 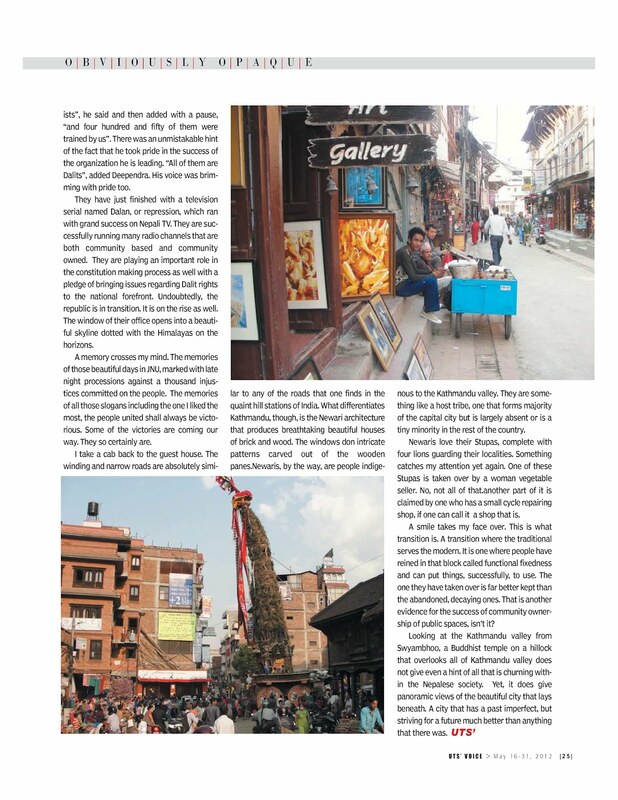 In fact, it’s not merely the Patan Darbar but all of Kathmandu valley that young couples have taken by a storm. Quite apparently, they are not merely from the upper echelons of the society. Nepal is in transition. India, the big brother that sits at its borders witnesses act of ‘honour’ killings just at the outskirts of its national capital. Breaking the stream of thought a boy asks me “Will you please click a photograph of us”? The couple looks at each other and then, a little coyly, holds hands. And then I saw the queue, not of human beings though. It was a queue of pots, mostly plastic ones, lined up in front of the two water taps located in the pond like structure with steps that stood at one of the corners of the Darbar. “What’s that”, I asked SachinGhimre, a Nepali friend of mine who was my junior at the Jawaharlal Nehru University in Delhi while I was enrolled there for my PhD. “What’s what”, he asked back. “That queue of the water pots in bright colours that only plastic can come with!” “Oh that”, Sachinlooked at the queue a little forlornly, “They are local people getting water as they don’t have tapped water supply for clean drinking water at their homes.” Were they allowed to do that beforehand? No, that happened only after the ‘janandolan”! Ordinary, poor people collecting their water at a place that once was a palace! That’s what this transition is all about. People reclaiming their lives and their resources, that’s what this transition is all about. This is the evidence for the fact that the republic is on the move even if a little short on resources. But then, once the will is firmly in place, all that the lack of resources can do is slow down the process a little, it cannot turn the tide back. Narendra spoke with a definite conviction. A conviction that was shaped by the will to move forward.A Conviction that was born out of the will to demolish all those structures that destined a section of Nepali population to a life of slavery and servitude.A conviction that dreams of turning the former Dalits as equal citizens of the new country, the one that is no more a Hindu nation.The one that has become a republic. We were sitting in the office of the Jagran Media Center, a non-governmental organization that works on the issues of Dalit rights. “We have a network of seven hundred journalists”, he said and then added with a pause, “and four hundred and fifty of them were trained by us”. There was an unmistakable hint of the fact that he took pride in the success of the organization he is leading. “All of them are Dalits”, added Deependra. His voice was brimming with pride too. They have just finished with a television serial named Dalan, or repression, which ran with grand success on Nepali TV. They are successfully running many radio channels that are both community based and community owned. They are playing an important role in the constitution making process as well with a pledge of bringing issues regarding Dalit rights to the national forefront. Undoubtedly, the republic is in transition. It is on the rise as well. The window of their office opens into a beautiful skyline dotted with the Himalayas on the horizons. A memory crosses my mind. The memories of those beautiful days in JNU, marked with late night processions against a thousand injustices committed on the people. The memories of all those slogans including the one I liked the most, the people united shall always be victorious. Some of the victories are coming our way. They so certainly are. I take a cab back to the guest house. The winding and narrow roads are absolutely similar to any of the roads that one finds in the quaint hill stations of India. What differentiates Kathmandu, though, is the Newari architecture that produces breathtaking beautiful houses of brick and wood. The windows don intricate patterns carved out of the wooden panes.Newaris, by the way, are people indigenous to the Kathmandu valley. They are something like a host tribe, one that forms majority of the capital city but is largely absent or is a tiny minority in the rest of the country. Newaris love their Stupas, complete with four lions guarding their localities. Something catches my attention yet again. One of these Stupas is taken over by a woman vegetable seller. No, not all of that.another part of it is claimed by one who has a small cycle repairing shop, if one can call it a shop that is. A smile takes my face over. This is what transition is. A transition where the traditional serves the modern. It is one where people have reined in that block called functional fixedness and can put things, successfully, to use. The one they have taken over is far better kept than the abandoned, decaying ones. That is another evidence for the success of community ownership of public spaces, isn’t it? Looking at the Kathmandu valley from Swyambhoo, a Buddhist temple on a hillock that overlooks all of Kathmandu valley does not give even a hint of all that is churning within the Nepalese society. Yet, it does give panoramic views of the beautiful city that lays beneath. A city that has a past imperfect, but striving for a future much better than anything that there was. Good one Samar bhai. I wish i was there with you. Keep up the great work.